MATC’s occupational programs are advised by external committees made-up of incumbent workers, program graduates and supervisors of employees in the occupation. 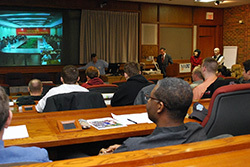 With MATC faculty and staff serving as resources, the committees are linked to the curriculum development process by providing insight and direction based on professional experiences. Program advisory committees assist in maintaining programs that are technologically current and responsive to workforce needs. The committees are critical in occupational program development, modification, and discontinuance.